Charles Lynch is due to get sentenced in March. Judge Wu technically has leeway to steer away from the minimum sentencing guidelines which, if followed, could have Lynch serving between five years and decades in jail. Things don’t look great for Lynch; Wu has rejected recent motions that would support veering from the guidelines. I imagine many people think Lynch should rot: He took a legal risk and should get whatever’s coming to him. They’re wrong. Here’s the argument for keeping Lynch out of jail, whether by an enlightened sentence or intervention from President Obama. 1. Charles Lynch wasn’t a drug dealer. Lynch is a former software entrepreneur who suffers from migraine headaches and found that marijuana—recommended by a doctor—helped. He found it burdensome to have to travel a hundred or more miles to find a marijuana dispensary, so he took his money from selling his business and started the dispensary in Morro Bay. He was a member of the Chamber of Commerce, and well known to local politicians and officials. In other words, he went through the front door, asked for permission, and let everyone involved know exactly what he was all about. Drew Carey, that radical host of “The Price is Right,” is among the many people who’ve looked at Lynch’s plight and decided he’s been persecuted. 2. He never should have been jailed. You all know the deal by now. California voters and lawmakers have decriminalized marijuana for medical use. It remains illegal, however, under federal law so there’s an obvious conflict. And, despite the seemingly clear language of the Constitution, federal law these days trumps state law. Unfortunately, San Luis Obispo County has a sheriff who opposes marijuana use under seemingly any conditions. Sheriff Pat Hedges has pot on his brain, even when it seems obvious he should have more pressing matters in mind. So Hedges, the court records clearly show, spent considerable time, man hours, and public money working to make a state case against Lynch. He never succeeded and ended up calling in the federal Drug Enforcement Administration to bring down Lynch. Many people have grown concerned with tallying precisely how much county money Hedges spent aiding the prosecution. We may never know, but the exact amount hardly matters. We know, based on court records, that numerous sheriff’s deputies were assigned to stake out the dispensary, to repeatedly attempt to purchase marijuana, and to try to purchase marijuana from dispensary employees outside of the dispensary doors. Those hours, with numerous and highly paid deputies, who later had to go to Los Angeles to testify, added up quickly. Suffice it to say more than $100,000 in scarce dollars were spent, and chalk it up to that. 3. He didn’t get a fair trial. Lynch was convicted of selling drugs. Under the federal system, his actions were no different from street-level thugs. The jury was not allowed to take into account that he was selling marijuana to people whose doctors recommended it. 4. We will not be safer with Lynch in jail. He posed no threat, he endangered nobody. His incarceration will cost us money and do nothing for the public welfare. So let Charles Lynch get off without jail time. There may be work to be done on California’s laws. It’s obvious that some of these dispensaries have operated as cash cows. It’s obvious that some doctors have become little more than dealers, giving out marijuana “scrips” in exchange for cash payments, in hopes of addressing virtually any ailments. People with sore shoulders or insomnia get prescriptions for medical marijuana just the same as the cancer battlers and wasting AIDS patients whose plights helped convince voters. That doesn’t seem right. Saying it’s medicine isn’t the same as saying it’s magic. Medicine works for some things and not others. Prescribing it for any old thing just opens the door to folks like our good sheriff, who seems to figure that if the potheads aren’t going to play fair, he isn’t either. Maybe marijuana should be decriminalized for any and all uses. Makes sense to me, since the 40 percent of adults who admit to trying it all know it is essentially as intoxicating as alcohol. No more and no less. The current approach comes at a stiff price. Our court systems, local and federal, are choked with nonviolent marijuana users. Those are fine reasons to change the law. Still, if decriminalization is the goal, then marijuana supporters should go through the front door and ask the voters to make that change. Letting every recreational pot user use the medical marijuana law to legally buy or grow only gives steam to the opponents. 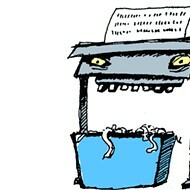 Shredder can be reached at shredder@newtimesslo.com.